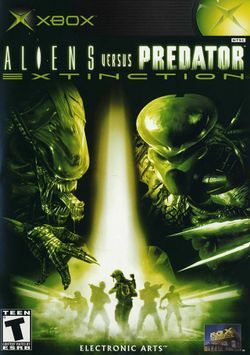 Aliens versus Predator: Extinction is the first Alien vs. Predator video game released for the PlayStation 2 and Xbox. Extinction is a real-time strategy game that can be played from the viewpoint of the Aliens, Predators or Marines. The object of the game is to progress each of these groups, building a bigger hive as the aliens, taking over territory as marines and winning hunts as the predators. This page was last edited on 30 November 2009, at 04:10.